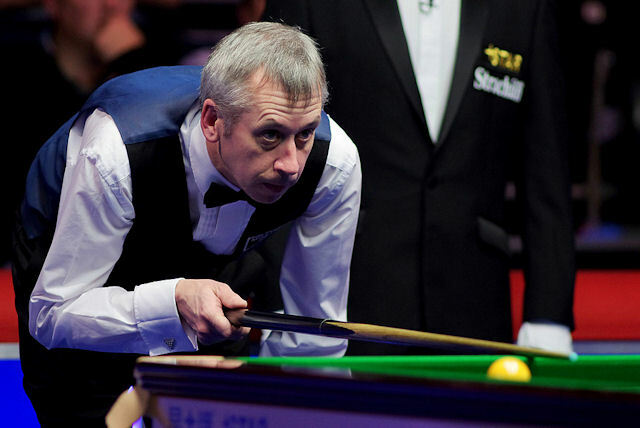 Nigel Bond made one of the great fight-backs in UK Championship history, recovering a 5-0 deficit to beat Barry Hawkins 6-5. Former British Open champion and World Championship finalist Bond has struggled for form in recent months but somehow came from the brink of defeat to knock out Hawkins – who is 55 places above him in the world rankings at number five. Derbyshire’s Bond goes through to the last 32 of the Coral-sponsored event in York to face Anthony McGill. Bond is responsible for a historic World Championship fight-back having beaten Cliff Thorburn 10-9 from 9-2 down in 1994, and now he can add tonight’s miraculous recovery to the list of unlikely wins in his 25-year pro career. Hawkins made breaks of 55 and 80 in winning the first five frames, but when he missed a green to a baulk corner when just a few pots from victory in frame six, the match began to turn. Bond ground his way back to 5-3 then compiled runs of 116 and 52 in making it 5-5. And always looked in control of a fragmented decider, winning it 57-2. Judd Trump cruised into the last 32 by beating Aditya Mehta 6-1 (Mark Rawlinson writes). It was the 25-year-old’s first match of the tournament as he received a bye through the first round after the withdrawal of Rouzi Maimaiti, but he looked sharp in defeating the 2013 Indian Open runner-up. The 2011 UK Champion knocked in runs of 72, 110 and 62 on course to victory and is confident of a strong run in the tournament this week. “I’m playing easily well enough to win the tournament,” said Trump. “I’ve got a lot of confidence right now. The way I’m playing in every tournament at the moment I’m showing a lot of form and it’s taking something special to beat me. Mark Williams also marched through to the third round with a 6-0 win over Sussex’s Jimmy Robertson. The 1999 and 2002 UK Champion hit breaks of 51, 55 and 83 to complete the whitewash and believes his shoulder strain is not causing him too many issues. “Jimmy struggled and missed a lot of balls but I punished him and my safety was excellent,” said Williams. “I had him in all sorts of trouble many times and I forced mistakes out of him. I won the first few which kept the pressure on and he’ll probably be disappointed that he didn’t play well but I think I shut him out. “I’m getting some victories at the moment, am playing quite well and scoring and just enjoying it at the minute. Robert Milkins also progressed by way of a 6-0 whitewash as he defeated Scot Marcus Campbell. The Milkman made breaks of 56, 78 and 64 although he is still struggling with an eye infection. “I’m getting blurred vision when I go down on a lot of the shots,” said the 38-year-old. “I’m trying to wipe my eye all the time and I’ve got a cold now just to top it off. I went to a doctor after I won my first match and they gave me some drops but to tell the truth they haven’t really helped. Milkins’ opponent in the next round is Graeme Dott as he defeated Anthony Hamilton 6-4 – a break of 69 in the final frame seeing him over the line. Ricky Walden prevailed in a nervy final frame decider against Robbie Williams to progress. Williams led 5-4 and had a good chance to seal it but missed a red, and International Championship winner Walden punished him by winning the final two frames to wrap up victory. There was another good win for 18-year-old James Cahill, who downed Andrew Higginson 6-4. Blackpool-based Cahill, who defeated Mark King 6-0 in the last round, hit top runs of 64, 61 and 58 to progress. Anthony McGill top scored with 92 in a 6-4 defeat of Igor Figueiredo.